Do animals have feelings? Do they think? Anyone who has had a close relationship with a pet like a cat, a turtle, a dog, or a bird, will jump at this question with a resounding; Yes! While they can’t all be like a Border Collie that has learned hundreds to thousands of words and sentences, we know first hand about their spark of intelligence and affection. In biology, this question becomes a tricky one. Traditionally Biologists were urged not to anthropomorphize animals and assign them what were considered “uniquely human” traits like emotion, thought, and consciousness. The practice has been considered speculative and unscientific, even though examples that require very little speculation are ever more abundant. Elephants have been observed as “grieving” over their fallen pack members. Octopuses can solve complex puzzles, sometimes just through observation. Cuttlefish use the powerful color-changing cells in their skin to communicate. Even hyenas have been shown to have complex social relationships and problem-solving abilities. 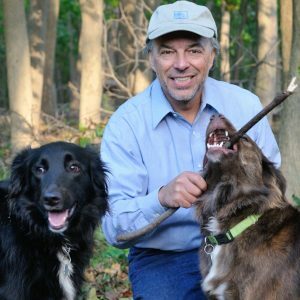 One particular speaker at the upcoming Bioneers conference in October, Dr. Carl Safina, has dived into this world of animal behavior. As a marine biologist, Carl Safina began his career researching seabirds. Through his work, he became a MacArthur, Pew, and Guggenheim fellow. He developed into an ecologist and marine conservationist as he increasingly found himself debating on the side of conservation. Eventually, he was pulled back to the science of animal cognition through his abundant curiosity. Carl Safina will address a keynote talk at the 2017 Bioneers conference and he has a message for you. Watch the video below and buy your tickets to Bioneers now! Early-bird rate ends on July 31.